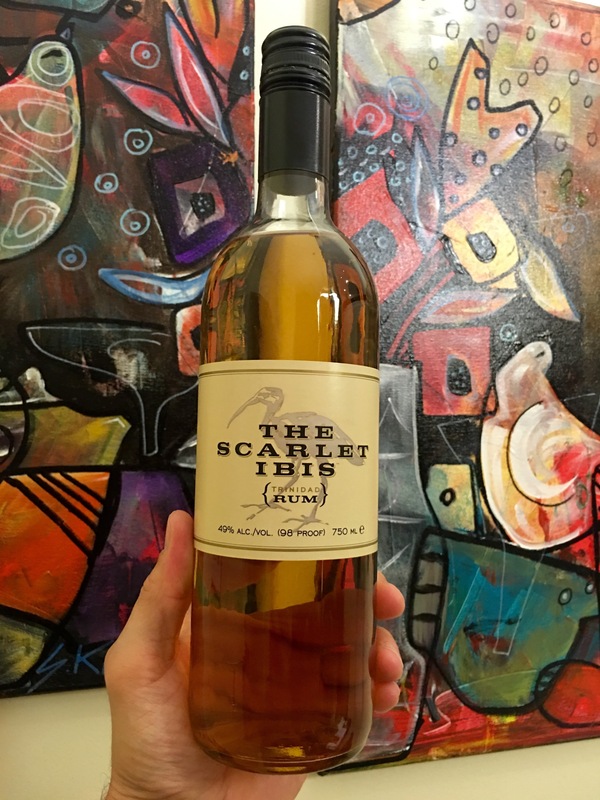 Have you found an online vendor selling The Scarlet Ibis Gold? The Scarlet Ibis rum was initially produced for exclusive use by the Death & Co bar in New York, and now available in available to the public in limited quantities as supplies last. This rum is a blend of pot-still rums from Trinidad that were aged 3-5 years in white oak casks. The name is derived from the bright pink Scarlet Ibis bird, which is native to the Caribbean and adorns the bottle. Fresh and light aroma. Smells like sweetened sea water with a subtle brininess to it, in a good way. Interesting peppery harshness at the front. The back end is where you find the faint molasses flavor. The finish is surprisingly smooth. No burn in the throat but a pleasant heat in the chest (that 49% doe). Would work great in a well crafted cocktail when looking to add a sharp flavor profile as opposed to sweetness. Definitely not an entry level sipping rum but enjoyable neat or on the rocks when looking for a peppery smack in da mouth. Unfortunately my bottle didn't come as pictured above with the attractive long neck and cork top. Better luck next bottle. Taste perfection, the absolute poster child for a young rum. It show's in style that a perfect rum does not need to be old. It just needs to be made with skill. No caramel added, aged for 3 years, a good high flavour carrying proof and pot stilled. Slightly too expensive at 45€ which means I won't buy it often but it still maintains a 10/10 because it is just that well made. A thoroughly enjoyable straight sipper. This rum may not be the most beautiful of rums, but it is - hands down - one of the best rums that i have tried. The taste is sharp but at the same time delicate and savory. If you prefer a rum that is not to heavy on fruit taste, you should try this. Enjoyed a bottle of The Scarlet Ibis Rum while in San Francisco. Unique bottle and label design. Golden color. Plenty of pepper, spices and some tropical fruits to your nose and palate. Surprisingly strong burn at the end being such a dry rum. Unique for sure. Not my cup of tea though. A bit strong straight up, but it mixed okay. I will give it some more time (and tastes) and adjust the rating as appropriate. A 5.5 on my scale..
49% ABV. I believe the bottle said the blend of Trini rums were aged 3–5 years before bottling. Interesting nose. Some high notes. Mouth is a bit deeper. Starts light and cane-y, but dry. You can detect the oily, smoky Caroni. Surprisingly long finish. Death & Company got something really good when this was developed for them. I love the proof, and I imagine this mixes like a charm. May need to make this my new "interesting" gold rum. Smells like wet hay and tropical fruit skin, then tastes real hot and fruity with a little toffee. I was only sampling this at a bar, and sipping it straight was less than pleasant, but I could see this being lovely in cocktails or on the rocks! If I get the chance to experiment further, I'll be sure to update! The 49%abv makes this pretty bitey, but the flavor is still very good. It's a little dryer than most, but still has some sugar, honey, and vanilla to it. The spice is very interesting. A bit spicy up front, get some barrel flavors, had it neat but I usually like ice but overall an excellent rum. One of the drier rums available with some alcohol burn, some hot spice notes like pepper combined with vanilla, caramel, brown sugar and banana. This is a fine rum to drink neat but also does well in mixed drinks. A+ rum, price is right proof is right. A bit obscure in the realm of classic rums. Perfect right down the middle young rum with a solid foot on the dry side. Care has been taken into crafting this, If your seeking good quality rum you will not be disappointed one bit. Fine fine sipper. Really well done. I like it a lot. I saw the positive reviews on this board, so i figured I'd check it out. First-off, and this is of minor significance, but online images gave me the idea that this had a cork-cap, yet i was dissapointed to receive my Scarlet Ibis with a screw-cap... sorry, I just hat screw-caps! Now, little more to the point - the real dissapointment came when i took my first taste: The rum was completley off-balance, inelegantly bottled at 49% (which i don't usually mind). Before any flavours reached my mouth or nose, i was overwhelemed by blatant notes of acetone. After the overpowering ethanol died down there were supple of hints of vanilla and tropical fruits, but overall it was just way to harsh for me. Nice rum some spice with smooth finish. Could be a good sipping, rum lost some with coke. This is what you'd expect from a good rum but rarely get in a single bottle. Strong but with mild and wide spread notes of wood and tropical fruits and a fulminant development in your mouth and palate. Not the cheapest but I will definitely get another one! Use only in high quality cocktails, if not better straight! Nose: Very banana forward with a ltitle vanilla in there to boot. Initial Tasting: Banana and spice up front; little bite. Body: Vanilla lingers a bit with banana still ruling the roost. Fade: Finishes with vanilla and banana on the tongue. This is a lovely well-rounded rum; somewhat dry and perfectly spicy. this is really smooth for a 3-5yo spirit. At 49% you would expect it to be hotter than it tastes too. This goes on the short list. VERY WELL DONE!!!!! This is an outstanding dry estery rum that has a lot of clove flavor to it. tastes like a spiced rum but it not. Adds a very unique aspect to mixed drinks, especially when used as the jamaican component in a Mai Tai. When it comes to my bar staples of rum for casual enjoyment I either swap between this and Pyrat. I remember the old recipe for pyrat, the one that was a little drier and a lot less sweet. This reminds me of that. The initial sip has a little more burn than usual, but that doesn't bother me. This rum is better than I expected based on the price. It's a little dryer than most, but still has some sugar, honey, and vanilla to it. The spice is very interesting; it's kind of unique (maybe allspice?) but quite good. Also has oak and pie crust. A little hot at 49%abv, but still very drinkable straight (maybe not for 'beginners'). fair rum. 49% ABV and initially sems quite Caroni like. However despite its young age an ice cube opens up the flavour held within the spirit. A very nice and different style of rum. This rum is special because it´s a bit harsh and at the same time it`s an important component in certain tiki drinks giving the drink a funk and it mixes well with other rums. It´s not a rum for everybody and certainly not a beginner´s rum. "This is a very special rum..."
"The truly uncommon genesis for this light, copper colored..."
Patrick from Uncommon Caribbean reviews The Scarlet Ibis rum. "On the tip of the tongue, there are notes of lavender and honey..."